In the year 1900, Thomas L. Kearns Sr. and his wife Mary opened a small "store-front" funeral parlor on Broadway in the Bushwick Section of Brooklyn at the suggestion of their local parish priest. This was the beginning of a service business that is now over a century old and presently being operated by the third and fourth generations of Kearns Family. Thomas and Mary had two daughters and five sons, and all their sons entered funeral service following their father. They were J. Clement, Leo F., Wilfrid T., Thomas L.,Jr. and Norbert W. Kearns Sr., and they conducted the business in Brooklyn and later in Valley Stream, Long Island, as Kearns & Sons Funeral Directors. In 1926, Leo Kearns moved to the Ozone Park section of neighboring Queens County and opened a funeral parlor to serve that newly developing community. Typical of its day, it too was a small "store-front" facility from which the funeral business was conducted, while the wake and visitation period usually took place at the residence of the deceased as a very normal facet of family life. 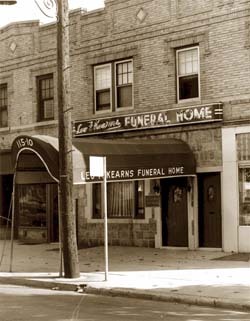 Gradually, as his business grew, Wilfrid, Thomas Jr. and Norbert W. joined their brother Leo and eventually incorporated under the name Leo F. Kearns Funeral Directors. Following World War II, there was a movement away from holding wakes and visitations in private residences, and the demand grew for communities to have modern, professional facilities in which funerals could be conducted. Recognizing this community need, the Kearns family bought property in Richmond Hill and eventually built a modern funeral home there in 1951. They then built a second facility in the Rego Park section of Queens in 1955. Today, the Kearns Funeral Homes are among the largest and most frequented funeral facilities in New York City. In 1995, Patrick J. Kearns, representing the fourth generation of the Kearns Family, entered funeral service and today serves as President of the firm. In addition to the Rego Park and Richmond Hill locations, the firm now operates in North Richmond Hill and East Meadow, Long Island. As this century-old firm serves in the Third Millennium, Patrick has now been joined by his brother-in-law Paul C. Kearns-Stanley. Together with their dedicated and professional staff, they represent a family which continues to serve other families of New York, some of which have themselves been turning to The Kearns Family for four and five generations. For many, at one of the important moments in their lives, "Kearns" has become a tradition and an expression of trust.